long admired, Jane Withers. I recall lusting over her lampshades at the National Centre for Craft & Design a few years ago – I’ll definitely find a spot for one at some point! But in the meantime, read on to find out more about her wonderful work and thoughts about the challenges facing designer makers at the moment. In our studio at Welbeck, myself and Michael Hanmer create contemporary knitted fabrics using hand operated knitting machines. 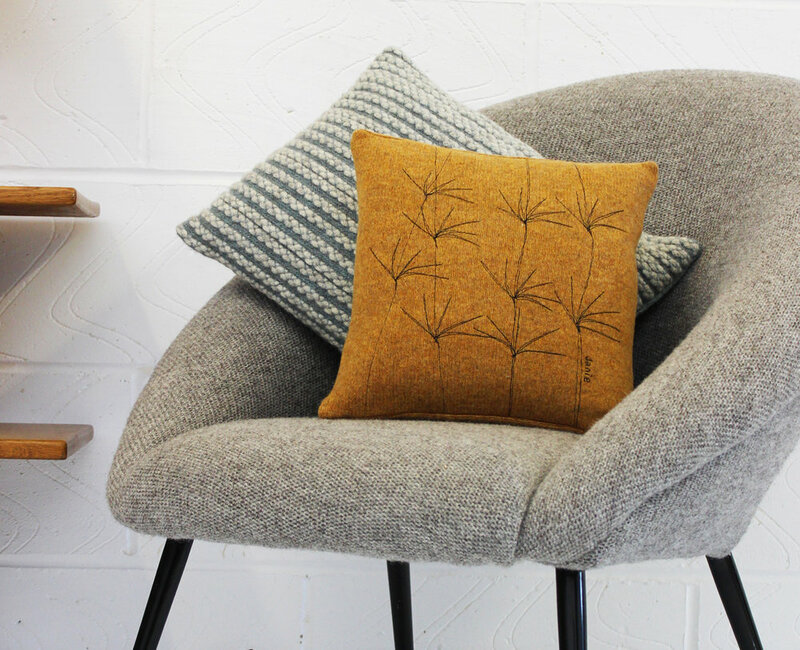 We produce an extensive range of useful and decorative home-ware products, including lighting inspired by patterns and colours from our rural surroundings, with an emphasis on natural fibres sourced from British suppliers. A typical day in the studio starts around 9am. We live in Nottingham and travel 25 miles north to our studio at Welbeck. Each day is different depending on the orders we have, I usually have three practical making days where I will be knitting or sewing and weaving lampshades, other days are for development work, marketing and admin. We have a lovely spacious space at the Harley Foundation at Welbeck in Nottinghamshire, where we are part of a group of artists. When I’m not working I enjoy getting out into the countryside and socializing. Janie Knitted Textiles was established in 2005, and since then we have had to be flexible to move with the times and adapt to changing economic forces! At the moment although there is lot of negativity around, however I think that there is also definite positivity for the future for trading nationally and internationally. As designer maker being noticed is a major challenge, in an ever-growing internet and social media world, finding your voice and how to shout about it is challenging! I would like to spend more time creating and developing ideas in order to expand our interior designs. It seems quite a while ago when we first started at home in the spare room. One tip would be not to be in too much of a hurry to achieve your ambitions. Have bite size ambitions which are realistic and grow slowly, you stand a better chance of longevity. Please share any favourite independent shops and galleries and tell us why you like them. The Just a Card campaign is such a great idea and I spotted it on Twitter and followed straight away. It’s a great motivator to generate awareness of independent businesses on the high street. The Just a Card campaign brings together all sorts of artists and makers and this can only be a good thing! Jointly we have a stronger message and it will only grow. I heard about the Just a Card campaign on Twitter which I have used for a number of years, together with Instagram and Facebook. The campaign has gained a lot of momentum owing to the hard work of Sarah Hamilton and colleagues. The recent Top Drawer exhibition has been a perfect medium to reach independent shops and stores to spread the word. I think it’s important for makers and artists if they have a website to show their stockists details and to make sure their prices are RRP. I try to keep mine up to date as customers ask and want to see my products available on the high street as well as online.